Sicily is located in the central Mediterranean Sea, south of the Italian Peninsula, from which it is separated by the narrow Strait of Messina. Its most prominent landmark is Mount Etna, the tallest active volcano in Europe, currently 3,329 m (10,922 ft) high, and one of the most active in the world. The island has a typical Mediterranean climate. The earliest archaeological evidence of human activity on the island dates from as early as 12,000 BC. By around 750 BC, Sicily had three Phoenician and a dozen Greek colonies and, for the next 600 years, it was the site of the Sicilian Wars and the Punic Wars, which ended with the Roman Republic‘s destruction of Carthage at the battle of Carthage (c. 149 BC). 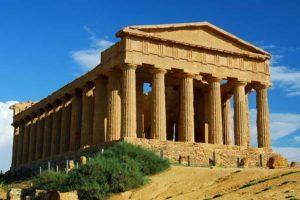 Sicily frequently changed hands after the fall of the Roman Empire in the 5th century AD, and it was ruled during the early Middle Ages by the Vandals, Ostrogoths, Byzantine Empire, and the Emirate of Sicily. The Norman conquest of southern Italy led to the creation of the Kingdom of Sicily, which was subsequently ruled by the Hohenstaufen, the Capetian House of Anjou, Spain, the House of Habsburg, and then finally unified under the House of Bourbon with the Kingdom of Naples as the Kingdom of the Two Sicilies. It became part of Italy in 1860 following the Expedition of the Thousand, a revolt led by Giuseppe Garibaldi during the Italian unification, and a plebiscite. Sicily was given special status as an autonomous region after the Italian constitutional referendum of 1946.